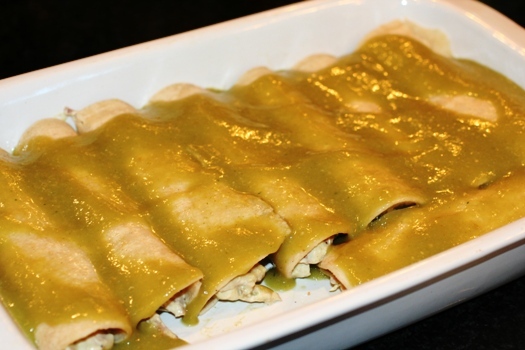 Of all the enchilada recipes I make, this one adapted from Cooking Light is hands down my husband’s favorite, and mine too. The cream cheese makes this so thick and creamy. 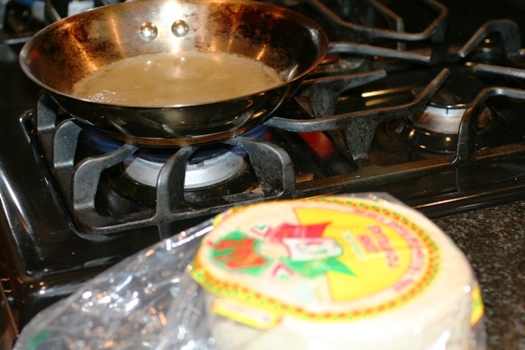 Using the corn tortillas adds a nice flavor that you don’t get from flour tortillas. The tortillas stand up better, so you don’t get the gooey floury taste. The green salsa brightens this dish up, while keeping it mild and very flavorful, adding the extra squeeze of lime gives it just the right finish. Pair a side of Spicy Black Beans with this and you are set! To make this dish easy, I use leftover chicken from the grill and pull out two to three cubes of frozen cilantro (see how I freeze herbs here) to save a little money. Each time I purchase cilantro, I flash freeze it in cubes for the next time I need it. Combine first 5 ingredients (onion through cumin) in a blender until smooth. 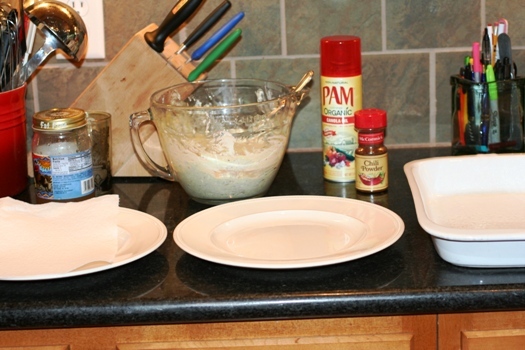 Mix chicken and cream cheese in a large bowl. Stir in 1/2 cup of the salsa mixture. Reserve remaining salsa mixture to pour over top. Bring broth to a simmer in a small skillet. Working with one tortilla at a time, add tortilla to pan; flip on to both sides until moist, turning once. Remove tortilla; drain on paper towel. I made a little assembly line with a plate to drain tortilla, one to roll it and then the dish right there to transfer it to. 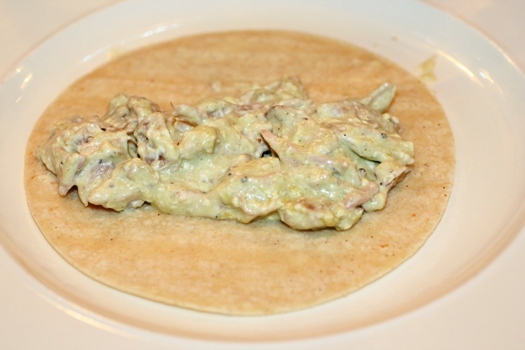 Spoon about 1/4 – 1/3 cup chicken mixture down center of tortilla; roll up. Place tortilla, seam-side down, in an 11 x 7-inch baking dish coated with cooking spray. 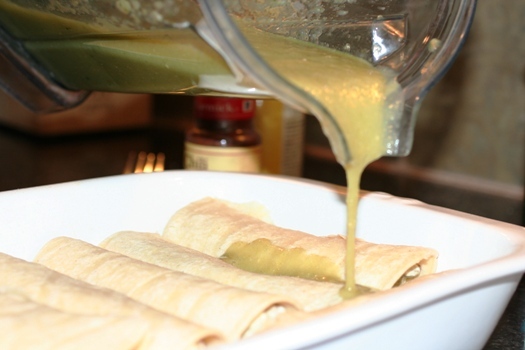 Pour remaining salsa mixture over enchiladas; sprinkle evenly with cheese and chili powder. Bake at 425° for 18 minutes or until thoroughly heated. Serve with lime wedges. Garnish with cilantro sprigs, if desired. Combine first 5 ingredients (onion through cumin) in a blender until smooth. Mix chicken and cream cheese in a large bowl. Stir in ½ cup of the salsa mixture. Reserve remaining salsa mixture to pour over top. Make an assembly line with a plate to drain tortilla, one to roll it and then a dish to transfer it to. Spoon about ¼ – ⅓ cup chicken mixture down center of tortilla; roll up. 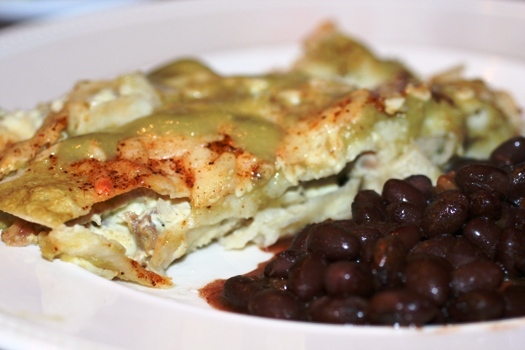 My hubby did a rotation out in Albuquerque, New Mexico and I learned to LOVE, LOVE, LOVE Green Chile Enchiladas. When I had my first child there the neighbors brought me meals including creamy style and regular style green chile enchiladas. I was HOOKED!!! Even now that we are back in VA, I grow New Mexican green chiles in my garden every year. I make them all the time and load ’em up with green chiles. Good Stuff! These look FABULOUS! 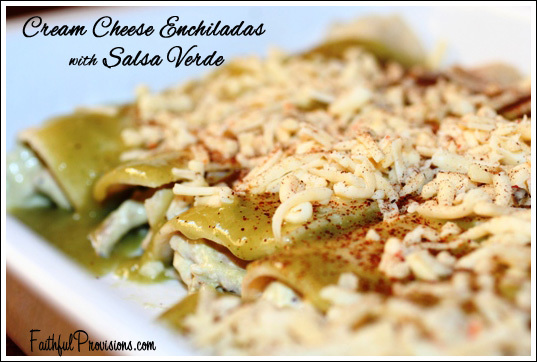 My husband loves TexMex cuisine, and I am always looking for new easy recipes =) Thanks for sharing! whats the purpose of putting the tortillas in chicken broth? if I use flour tortillas is that step still necessary? Sounds good. I don’t own a blender though. Maybe I could just stomp on all those ingredients in my bathtub. Sounds delicious. Can I ask how spicy this recipe is? I’m the brave one my hubby not so much. He doesn’t like spicy or hot foods. Thanks. 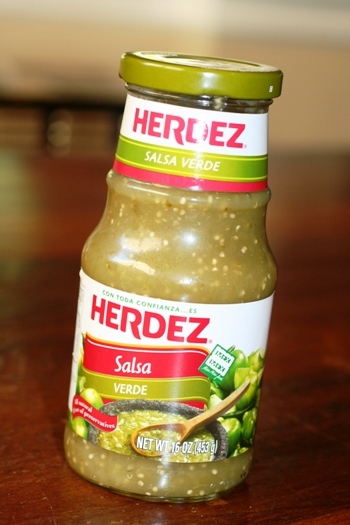 This one is extremely mild, as long as you get a milk salsa verde you are great. I spice mine up with Frank’s Red Hot sauce. My family loved these. I also added corn to the mixture. I made these a few nights ago, paired with the spaicy black beans, and they were fantastic. I only had flour totilla shells but it worked. Made these last night and everyone loved them. This recipe is fast, easy, delicious, and a keeper. Thank you! 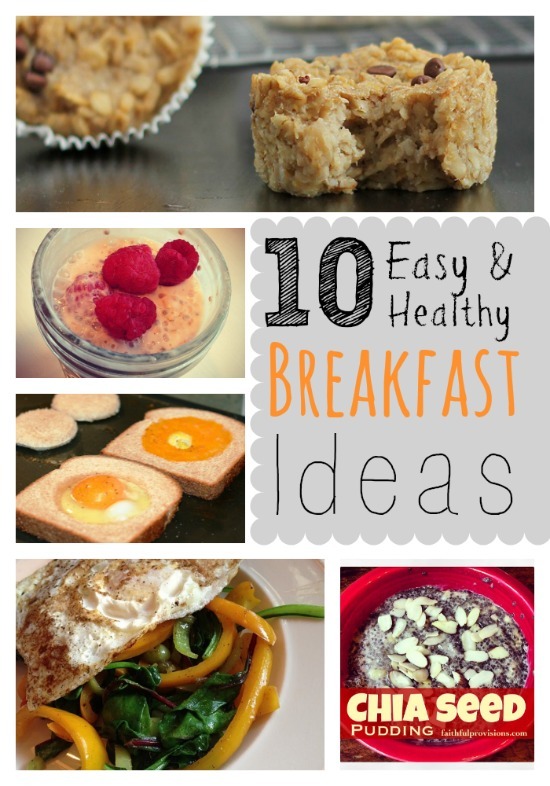 These were very good and so easy to make. I didnt have a food processor so I just mixed everything together and made it that way! It was very good. I couldnt stop eating it. Healthy too!! I also didnt dip the corn tortillas in the chicken broth I found that if you heat them up in the microwave with a papertowel they are soft and dont fall apart. 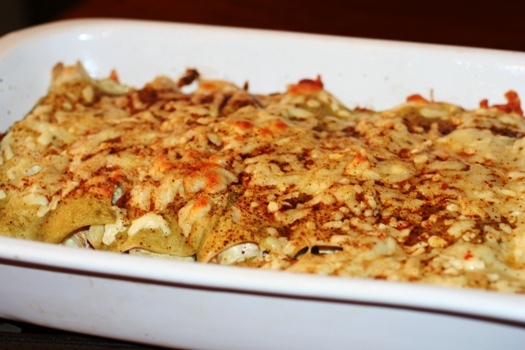 This is a great recipe and we have eaten it several times. Have you ever tried freezing it? I wonder about the tortillas, but if you froze it before baking, it might turn out okay?? What do you think? These were a hit!! My family loved them!